Below is a visualization and description of some of the most significant incidents of political violence in Nigeria from April 6 to 12, 2019. 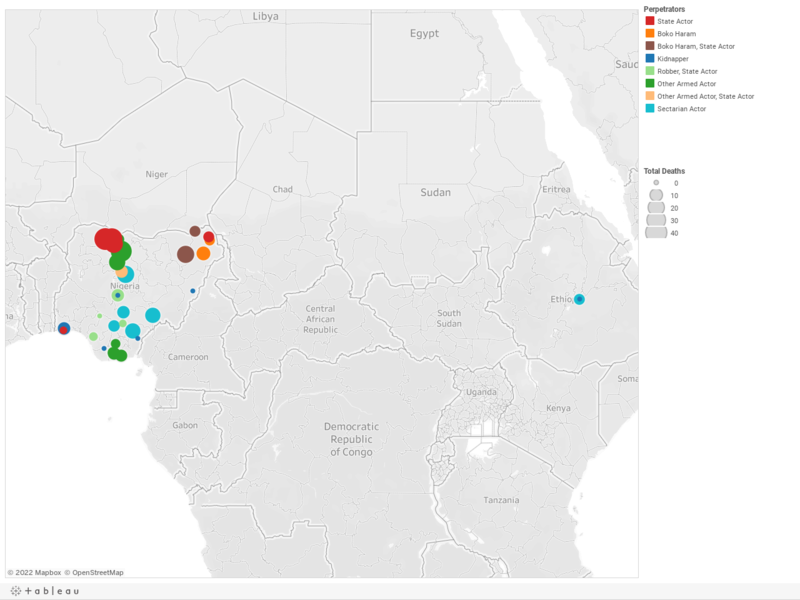 This update also represents violence related to Boko Haram in Cameroon, Chad, and Niger. These incidents will be included in the Nigeria Security Tracker. April 6: The Nigerian Air Force killed twenty-five bandits in Birnin-Magaji, Zamfara. April 6: Two suicide bombers killed themselves and nine others in Jere, Borno. Boko Haram was suspected. April 6: Police killed three bandits while the bandits killed two officers and three civilians in Birnin-Gwari, Kaduna. April 6: Gunmen kidnapped eight in Kosofe, Lagos. April 6: Herdsmen killed six in Anambra West, Anambra. April 6: Sectarian violence led to fifteen deaths in Izzi, Ebonyi. April 7: Herdsmen killed a policeman and seven others in Omala, Kogi. April 7: Thirty-six bandits and vigilantes were killed during a clash in Kankara, Katsina. April 8: Herdsmen killed twenty-one in Kajuru, Kaduna. April 8: The Nigerian Air Force killed "several" (estimated at five) Boko Haram militants in Kukawa, Borno. April 8: The Nigerian Air Force killed "scores" (estimated at forty) of bandits in and around Maradun, Zamfara. April 9: Eighteen bandits and vigilantes were killed during a clash in Sabuwa, Katsina. April 9: Bandits killed five in Batsari, Katsina. April 9: Nigerian soldiers repelled a Boko Haram attack in Damaturu, Yobe, killing "many" (estimated at twenty) militants. April 9: Two Boko Haram suicide bombers killed themselves, one policeman, and two security forces in Diffa, Niger. April 9: Herdsmen killed five in Ethiope East, Delta. April 10: Gunmen abducted four travelers in Ethiope East, Delta. April 11: Sectarian violence led to fifteen deaths in Ukum, Benue. April 11: Two Boko Haram suicide bombers killed themselves and two others in Monguno, Borno. April 1–11: Over ten days, Nigerian troops killed thirty-five bandits in and around Zurmi, Zamfara.